The Intervention is a very overstable distance driver that will fly true in any wind and is a great utility disc. The Intervention is a very overstable distance driver that will fly true in any wind and is a great utility disc. 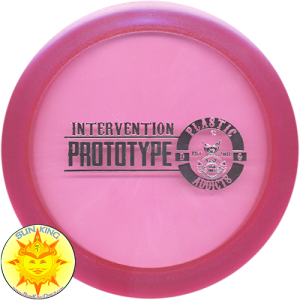 Produced as a variation of the Discraft Venom, the Intervention is extremely fast. If you’re a fan of predictability look no further, the Intervention will always deliver for you. Excellent for forehand and overhand throws. The Top Line plastic is a translucent super premium material with a shimmering effect that is extremely durable and comes in a wide variety of vibrant colors.